Transparency International conducts an annual research into the corruption perception of different countries, and as per the latest report released today, there is some good news for India as we have improved our ranking by two places. Compared to last year when India was ranked 94 out of 177 countries, we are ranked 85 out of 175 countries this year, climbing up 9 places. Corruption Perception Index (CPI) extracts a score based on various factors related with fighting corruption, and India has received a CPI score of 38, which was 36 last year. On a scale of 0-100, 0 is perceived as being highly corrupt, and 100 is considered as least corrupt. Denmark, with a CPI score of 92 has been ranked #1 while North Korea and Somalia are ranked worst with CPI scores of 8. Infact, out of 195 countries surveyed and analyzed, more than two-thirds have a score below 50, which is quite alarming. What Caused Improvement in India’s Ranking? World Economic Forum’s (WEF) improved score for India: WEF measures how easy it is for business establishments to use corruption in order to get their jobs done. For example paying unaccounted money for imports/exports, payment of bills etc. An improved score means that corruption is getting harder and difficult in India. World Justice Project’s (WJP) increased index score for India: WEJ measures the perception of public in general about corruption in mainly these Government functionaries: executive branch, judicial branch, police/military, and the legislature. An improved index reflects that public in general is now aware that corruption will be dealt with an iron hand, and getting away is not easy. Transparency International has used 12 independent data sources for calculating this corruption index, and 9 out of these 12 data sources are related with governance and business climatic analysis such as Bertelsmann, Foundation, World Bank and World Economic Forum. How To Improve India’s CPI Score? An early appointment of Lokpal . Compulsory audit of accounts of political parties. Enactment of legislation for forfeiture of illegally acquired property. Speedy trial of criminal cases against Ministers, MPs and MLAs. Effective Implementation of UN Convention Against Corruption. When PM Modi took oath as India’s 15th Prime Minister this year, this focus on creating a corruption-free India is not hidden. In every speech and presentation he gave, supporting anti-corruption movement was one of the most important goals of his government. However, the report clearly mentions that all data and facts collected for this year’s survey happened before the new government took over, hence there is very little effect of PM Modi in improving India’s ranking. Having said that, the report also mentions that the new Government was elected on the anti-corruption mandate, on the possibility of some new reforms and a hope for a better India. And the current CPI index score and the improved ranking reflects just that. You find the complete report here. 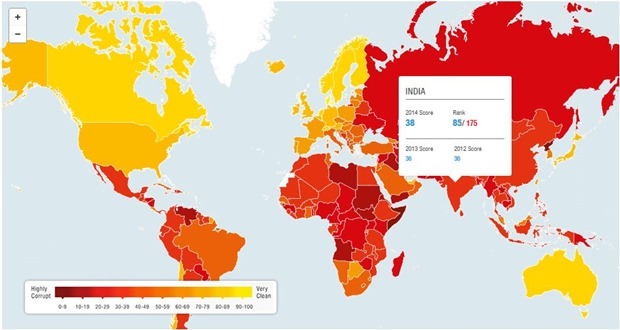 "India Improves On Corruption Index, Now Ranks 85th In World", 5 out of 5 based on 1 ratings.